Dio Dell 'Amore - Jeffreys Bay Accommodation. 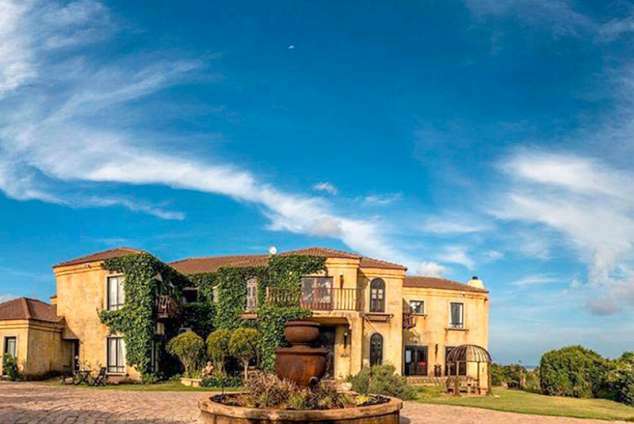 Dio Dell'Amore Guest House reflects the opulence of Tuscany, and is situated right on the shores of the Kabeljauws River Mouth in Jeffrey's Bay. This Five Star Guest House is set in a tranquil escape that any discerning traveler or business person would appreciate. Our approach is warm and welcoming and our service ensures that guests individual needs are catered for and their privacy respected. In a relaxed atmosphere with optimum convenience and comfort you can enjoy beautiful breaker views, ocean scenery with the dolphins and the whales, the lagoon with all the water sport and the mountains. Dio Dell'more is your home away from home. Ted, a Lawyer and Bonsmara Farmer and Louise the owner of two very popular coffee shops, Legato & Gawila in Springs, Gauteng, decided in December 2012 that it was time to plan the next twenty years of their lives. It was a decision made over a glass of wine that they never thought would happen so quickly. Within a few weeks the farms and coffee shops had new owners. Ted told one of his clients about their decision to invest in a guest house, and because Jannie was a regular client at the coffee shops and knew Louise so well, he had the perfect guest house in mind. They have never been to Jeffrey’s Bay and never thought that they would immediately fall in love with this beautiful Tuscan look Guest House. Ted, who loves being outdoors, is a keen mountain biker and animal lover. Ted is now the owner of Ted Groenewald Attorneys and Estate Agency in Jeffrey's Bay, and Louise with her years of experience in coffee shops now also has Suikerbossie Pancakes and Gifts. Her warm personality welcomes you and she is committed to ensuring that your stay here is an experience you will want to repeat. Ted and Louise live in a separate home on the smallholding and are always close enough to accommodate guests needs or special requests. Rooms at Dio Dell'Amore are individually decorated and attention was given to the finest of details. All rooms are equipped with air-conditioning, DSTV, free internet access, mini bar, coffee/tea tray and a personal safe. Rooms have en-suite bathrooms with a shower and a bath. Each room has a balcony or patio with beautiful breaker views, ocean scenery, lagoon with the mountains, Mashie golf course, indigenous garden, swimming pool or Koi Ponds. Beautiful spacious room with King size poster bed and open bathroom with separate toilet. Balcony with amazing breakers views, the dolphins and the whales and all the water sport on the lagoon can be seen out of this room. Ideal room for a Honeymoon! Beautiful spacious room with the best sea views from your bed. Spacious room with beautiful breaker and lagoon views. Spacious room with en-suite bathroom and balcony. Lovely sea views with all the water sport on the lagoon. Our business travelers room with en-suite bathroom. Beautiful garden and distance sea view. Spacious family room with en-suite bathroom. Ideal room for a family. Baby cot available. Wheel chair friendly room with spacious bathroom with shower only. On the ground floor with beautiful garden view. Lovely room with en-suite bathroom for the busy business traveler. on the ground floor with patio. Detail description : Come and experience the opulence and charm of Tuscan life along the shores of the Kabeljauws River Mouth in Jeffrey’s Bay. ​ Eight stylish rooms have each been individually decorated and furnished with everything you’ll need for a comfortable and relaxing stay. Equipped with air-conditioning, DStv, mini bar, WiFi and tea & coffee facilities, as well as a balcony or patio from which to enjoy the stunning sea, lagoon, garden and mountain views, you’ll feel right at home. ​ You’ll be ideally positioned to explore bustling Jeffrey’s Bay and its surrounds. There is plenty on offer, from adventure activities such as hiking, mountain biking, zip-lining and scuba diving, to an array of exciting attractions including the Lion Park, Addo Elephant Park, Supertubes, Cheetah Sanctuary, the Tisitsikamma National Park and much more. A selection of fantastic restaurants and shops will also be at your fingertips. ​ Tuck into delicious breakfasts each morning before heading out for the day, or simply unwind next to the swimming pool and catch some sun in the summer. Hosts Ted and Louise are ready to welcome you warmly to their little slice of Italy in South Africa, be if for business or leisure. 583 page views since 18 Jun, 2018.